Abdominal Cuts Active for Women - Diet Pill Reviews: Does Abdominal Cuts Active for Women Really Work? Abdominal Cuts Active for Women is another option in a long line of weight loss supplements in the Revolution line by Corr-Jensen Labs. Expanding on the popularity of their original Abdominal Cuts formula, this product focuses specifically on the female dieter and the unique hurdles she faces as she works to achieve her weight loss goals. The primary target of this weight loss supplement – along with effective fat burning – is reducing stress that can contribute to less healthy lifestyle habits and weight gain. The product also claims to reduce water retention, a common problem for women, while providing a dose of nutrition that improves a woman’s health overall. The primary focus of Abdominal Cuts Active for Women is a hormone in the body known as cortisol. This hormone is released during stressful times in a woman’s life and encourages the storing of fat around the midsection. By inhibiting the release of cortisol, this weight loss supplement claims it can help combat the physical effects of stress on the body, while promoting weight loss by burning current fat stores for energy. 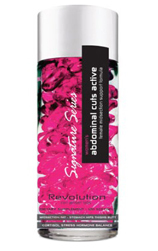 The ingredients in Abdominal Cuts Active for Women include conjugated linoleic acid (CLA), medium-chain triglycerides (MCT), sesamin, vitamin E and vitamin B12. We were not able to get a full ingredient list off the company website, since only a couple of the ingredients in the formula were mentioned. While we did find additional ingredient listings on other websites, we could not locate specific amounts of the substances to determine where there were sufficient amounts to produce the desired effects. We do know that CLA has rapidly become a popular ingredient in weight loss supplements due to its ability to help the body burn fat without the use of stimulants. While initial studies on CLA have been promising, the jury is still out on just how effective this substance can be. Other ingredients in the mix appear to be present because of their ability to lower cholesterol and blood pressure, which may help combat the physical effects of stress. There does not appear to be an ingredient in the formula to suppress appetite or regulate blood sugar levels – two other stress-related concerns.